Most of the growing number of installations of utility-scale solar photovoltaic (PV) operating capacity across the United States have been systems that make use of crystalline silicon panels. In 2016, 70% of U.S. utility-scale PV capacity used crystalline silicon modules. 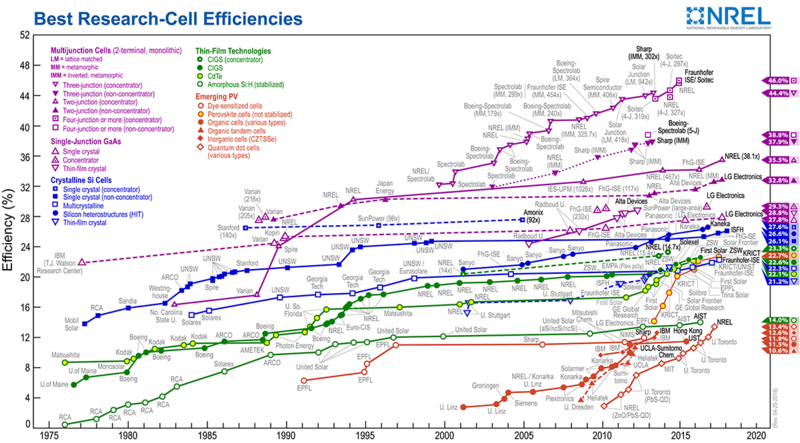 Thin-film technology accounted for 28% of capacity. Crystalline silicon is typically the technology of choice for solar PV project developers because of its higher cell efficiencies, space-efficient designs, and long module lifetimes. Thin-film modules, however, are often less expensive than crystalline silicon and can be more attractive to some project developers. Thin-film modules also can be more flexible, lighter, and easier to handle than crystalline silicon. California had nearly 8.5 gigawatts (GW) of installed utility-scale solar PV capacity at the end of 2016, the most in the country. California’s crystalline silicon PV capacity (5.0 GW) and thin-film PV capacity (3.5 GW) were each larger than any other state’s total utility-scale PV capacity. North Carolina, the state with the second-highest installed solar PV capacity, had 2.1 GW of crystalline silicon PV capacity and 0.3 GW of thin-film PV capacity. 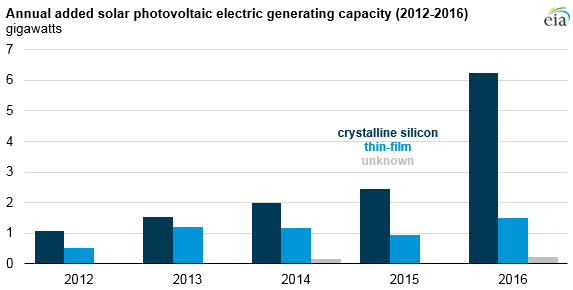 Almost all states have more crystalline silicon capacity than thin-film capacity. Nevada is one of the few states—and the only state among the top 10 of total solar PV capacity—with more thin-film capacity. Crystalline silicon is a semiconductor of electricity with chemical and structural properties of a crystal lattice, enabling crystalline silicon solar cells to efficiently convert light energy into electricity. Crystalline silicon modules are also inexpensive because silicon is relatively inexpensive—it is the second-most abundant element on earth. Thin-film technology uses other semiconducting materials including cadmium telluride, copper indium gallium selenide, and amorphous silicon. A thin-film solar cell is manufactured by depositing one or more thin layers of PV material on a supporting material such as glass, plastic, or metal. Cadmium telluride is the most commonly used thin-film PV technology, making up 97% of the total installed thin-film capacity in the United States. Thin-film cells generally have lower efficiencies than crystalline silicon cells, although in recent years the efficiencies of cadmium telluride technology have improved to match some less-efficient crystalline silicon cells. Cadmium telluride cells are much lighter than crystalline silicon cells, making them more suitable for low weight-bearing applications. Installation levels of thin-film solar PV capacity were relatively constant over the past five years, with only a modest increase between 2012 and 2016. Crystalline silicon installations, however, increased significantly over that period, driven by decreases in the cost of crystalline silicon manufacturing. Crystalline silicon PV capacity increased 3.8 GW (61%) between 2015 and 2016.